Gov. Jack Dalrymple (R-ND) gives his biennial budget address to the Legislature's organizational session Wednesday in Bismarck. Hear the complete speech here. North Dakota Senate Democrats have picked their leadership team for the 2013 Legsilature. Sen. Mac Schneider (D-Grand Forks) will be the new Minoity Leader. He replaces Ryan Taylor, who was an unsuccessful candidate for Governor, and leaves the state Senate. Schneider was unopposed for the floor leader job. Schneider says Democrats may be in the minority – but they need to speak out on issues and ideas. Democrat Heidi Heitkamp overcame the odds – and the pre-election polls – to win the election for the US Senate. The margin was razor thin. She defeated Republican Congressman Rick Berg by less than one percentage point. 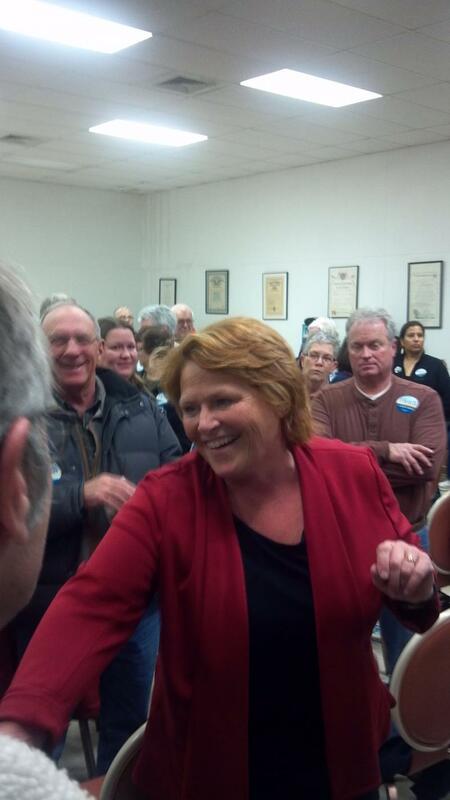 Heitkamp took a “victory lap” around North Dakota Thursday – to thank her supporters. Several hundred people welcomed Heitkamp to the labor temple in Bismarck, as the tired and hoarse US Senator-elect finished a four-stop victory tour. They chanted "Heidi, Heidi" as Heitkamp entered the room. Many observers felt the US Senate race in North Dakota would be a close one. And there is no clear winner – yet. Unofficial results show Democrat Heidi Heitkamp with a 2994 vote lead over Republican Rick Berg. Heitkamp collected 160,752 votes, while Berg's total was 157,758. Speaking to supporters, Heitkamp declared victory. North Dakota Democrats rallied in support of Congress candidate Pam Gulleson and Senate candidate Heidi Heitkamp in Fargo Monday night – with the help of a popular party faithful friend. Prairie Public’s Danielle Webster has the story. The budget, the deficit, health care -- and Harry Reid. Those were the subjects of the final US Senate debate between Rep. Rick Berg (R) and Heidi Heitkamp (D). The 60-minute debate -- sponsored by the League of Women Voters and the Bismarck Tribune, and held at Bismarck's Horizon Middle School, featured some sharp exchanges between the two candidate. The two candidates agree that the current federal budget deficit is unsustainable. But they have different ideas on how to close that gap. Berg said it will take a bi-partisan agreement to reduce the deficit. Chancellor: New admissions policy "a work in progress"
That’s how University System Chancellor Ham Shirvani describes the plan for admission standards for the state’s colleges and universities. Shirvani told an interim Legislative committee that the standards are based on a student’s ACT score, grade point average, whether a student is a state resident and whether the student has completed the core high school curriculum. Shirvani said the numbers aren’t yet finalized, but the plan is to have these in place by 2014. 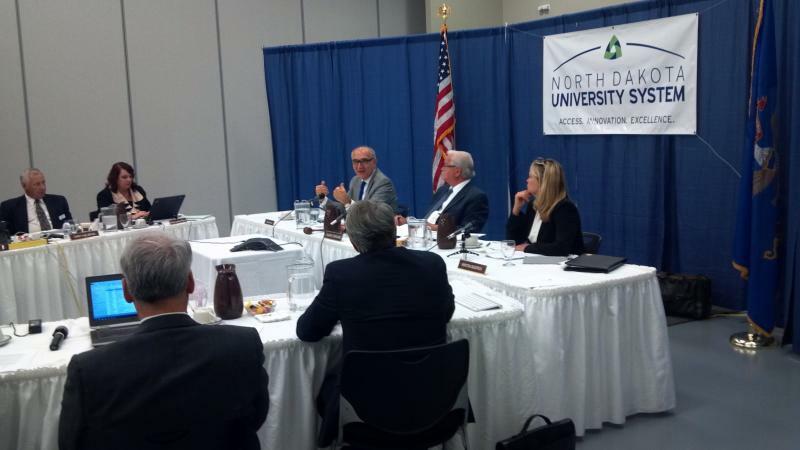 Future North Dakotacollege students will have to meet tougher entrance requirements. The state Board of Higher Education approved the plan for more stringent standards proposed by new Chancellor Ham Shirvani. Shirvani calls it the “Pathways to Student Success.” He told the Board the system consists of three types of institutions – community colleges, regional universities and research universities. He says while there would not be admissions standards at the community colleges, the other two tiers would have standards.